Are you about to write an academic text? Welcome to the Writing Guide, where you will find guidance on writing texts such as academic papers, abstracts, literature overviews, reports and research articles. One section takes a closer look at how to get started on your writing and the various parts of the writing process. You will be given examples of how extended texts can be structured and how to create cohesion in your text. You will also get advice on academic language and various levels of style. Why do academic texts have a distinctive appearance? The clearest characteristic of an academic text is its appearance: its style and structure. An academic text is formal, objective, precise and focused. It is very important that your writing reflects that these characteristics are derived from the academic text’s purpose. The reason that academic texts have a certain form is that within science, to spread and push research forward, there has been a need to communicate information as correctly and objectively as possible. Thus the characteristics of academic texts are not in themselves important, but a way to achieve the aim of reaching out to others with your results and thoughts. It is this function, and this aim, that you need to focus on in your writing. Instead of asking yourself: “How will I be able to follow all the guidelines I have received for academic writing?”C ask yourself: “How will I be able to communicate my thoughts, so that my readers understand the points I am making?” With this approach, you will be able to look beyond the details and focus on the text’s function: to communicate often complicated content, as a line of thought or result of a study, in the most effective and precise way. A common aspect of all academic texts you will write, such as examination answers, laboratory reports and academic papers, is their aim to communicate. It is your task as the writer to explain the subject you are writing about. You can learn more about how to do this as effectively as possible in the sections, Academic language and Creating cohesion. Another common aspect is that academic texts are aimed at specialists who want to gain new knowledge about the subject you are writing about. This means that, in addition to being clear about the knowledge your text offers, you can assume that your readers have certain prior knowledge in the area. Therefore, you should use basic terms within the scientific field you are writing about. Imagine that you are writing for one of your fellow students. Ask yourself: How shall I formulate this so that the reader understands what I mean? What do I need to clarify? What can I omit? 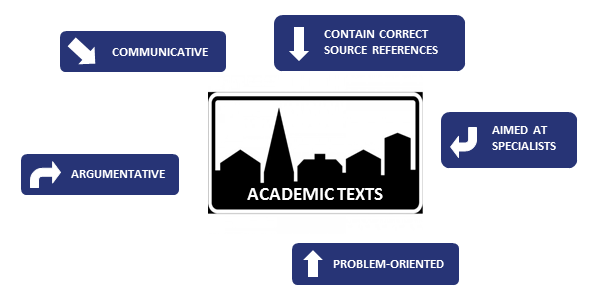 The third common aspect of academic texts is that they are problem-oriented. This means that the text takes its starting point from a, more or less, specific research issue and has a definite aim as a basis for the text. You can learn more about how to compose a research issue and an aim in the sections, The writing process and Parts of an academic paper. A further common aspect of academic texts is that they contain correct source references. This means that there shall be a clear indication about what information your text is based on. You can learn more about how to do this in the section Managing references. It takes a long time to become a good writer and communicator, but with every attempt you will improve. Therefore, make sure you have plenty of time for your writing. Before you continue on to the other parts of the Writing Guide, we would like to give you a basic tip: be an aware reader. When you read academic texts, don’t just look at the content, but also at how the authors have expressed themselves. Using this approach, you will gradually build up a bank of good examples that you can use in your own writing.